(Tampa, Florida) – With the exception of some geographic variability, commercial office space remains amply available to the buying/leasing community. As a result, many owners recognize the necessary investments that must be made to remain competitive. No where is that challenge greater than in older office buildings. The SouthTrust Plaza of downtown Tampa is just such a facility. 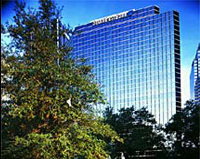 It is ranked as Tampa’s ninth-largest office tower, and was constructed in the early 1980s. By the late 1990s the 20-story building needed an upgrade to include a low maintenance system that would reduce energy costs. In August of 1998, building management hired Automated Building Controls Systems Inc. (ABC), a local partner of KMC, to upgrade the control system to the KMC product line. The project was completed by December that same year. In the year 2000, the building was purchased by CB Richard Ellis investors (CBRE now manages and leases the space.). The new owner invested $1.8 million in improvements, including updating the building with a digital 24-hour security system that also ties the elevator and fire alarm together. ABC worked closely with other contractors to integrate the new systems into the existing KMC program. Today, SouthTrust Plaza serves as reminder of the success associated with proper investment. Its signature archway greets clients coming from the sites and sounds of the Franklin Street Mall, Lykes Gaslight Square Park, the Hyatt Regency Hotel and City Hall. The building is within easy walking distance to the Courthouse, several banks and over a dozen restaurants and dining clubs. Inside, amenities include a bank, dentist, sandwich shop, copy center, hair salon, and executive suites. An attached garage with valet and tenant parking, 24-hour electronic security, on-site management and service staff, as well as a security guard helps clients feel secure. Of course, the greatest owner benefit achieved through these investments has been a secure competitive position.